There's an upside and a downside to a show airing their pilot during their panel... the fact that Comic-Con panels typically last just one hour, whether they include the airing of a pilot or not. So when a pilot is aired suddenly you go from nearly an hour of getting to hear the actors, and the powers behind a show talk and answer questions, to just 15 minutes of that first-hand style content, with the rest of the time being spent engrossed in a show others have not yet had the chance to see. 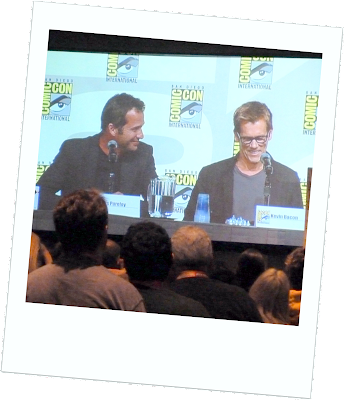 In the case of The Following as interesting as the pilot was to see, the chance to hear Kevin Bacon and James Purefoy, actors who more known for their screen work than tv work, especially in the case of Kevin Bacon, speak and answer questions, was what many of the audience members had come for. In addition to the actors, there to talk about their roles, was again someone from the behind-the-scenes portion of the show. In this panel their was a brief, interesting discussion about how one scene that could have been extremely violent and gory was implied rather than shown, simply by making it clear to the audience what a character was about to do, then showing people's reactions, and enough evidence around the set to imply it had happened and yes, it was as bad as the audience feared. A choice it feels fewer and fewer shows are making in this days of ever improving special effects, make-up techniques and props. Unless otherwise noted, PopArtsPlace.com's 2012 coverage was done by Kay Kellam and Angie G. We'd like to thank John Mayo, Erica C., Linda C., and David S. for helping us out throughout the week. They were extra eyes and ears on numerous occasions, and whenever possible we tried to return the favor.